Within the last year, I’ve introduced over 100 bowling clubs to the magic of Compost Tea for bowling green health. Compost Tea is a home made spray that is applied to fine turf to increase the micro life in the soil. It reintroduces missing microbes and boosts the populations of all of the main beneficial microbe groups such as bacteria, protozoa and the all important Fungi. Some of these help to degrade thatch, turning it into valuable humus, giving life and body to the depleted and often excessively sandy soil in many bowling greens. Tea is a bit of a misnomer to start with as what we are making is more akin to a soup. Instead of carrots, leeks and lentils though, this particular soup’s main ingredients are a mass of microorganisms (microbes) which are naturally found in a healthy soil. The term “soil microbes” is a catch all description for a variety of different microorganisms which, in naturally occurring healthy soils include many billions of bacteria, billions of fungi, millions of protozoa and nematodes, all of which have their own roles in the bowling green ecosystem. The word tea here is used more to illustrate how the brew is made. It’s very much like making tea. We use a brewer (teapot) and the initial microbe population of the final brew are contained within a compost mix, in what is essentially a big teabag. During the compost tea brewing process these aerobic microbes are encouraged out of the compost teabag into the water in the brewer. Given the right conditions these soil microbes replicate and grow in number very rapidly and this is the reason for the tea brewing process, to make a spray solution that is abundant in beneficial soil microbes. To encourage this rapid upscaling in the microbe population we add a food source to the tea brewer. This can be formulated to encourage a bacteria dominated tea for annuals such as Annual Meadow Grass (Poa annua), or a fungi dominated tea for perennials like bentgrasses (Agrostis) and fescues (Festuca). More on the reasons for that here. It’s Cheap at £5 a go! Once you are set up with some simple kit to brew your own tea, you can easily be making a full application for as little as £5 each time, so you can do it as often as you like without worrying about the cost. Split the Compost pack from your Compost Tea Starter Kit 4 ways and store carefully. When the brewing process is finished, remove the teabag and strain the tea directly into your sprayer using the filter supplied in your kit ready to apply to the green. For problem areas or very tired/sick greens you can apply it neat to the turf, but it’s more common to dilute the tea 1:3 with water before applying. 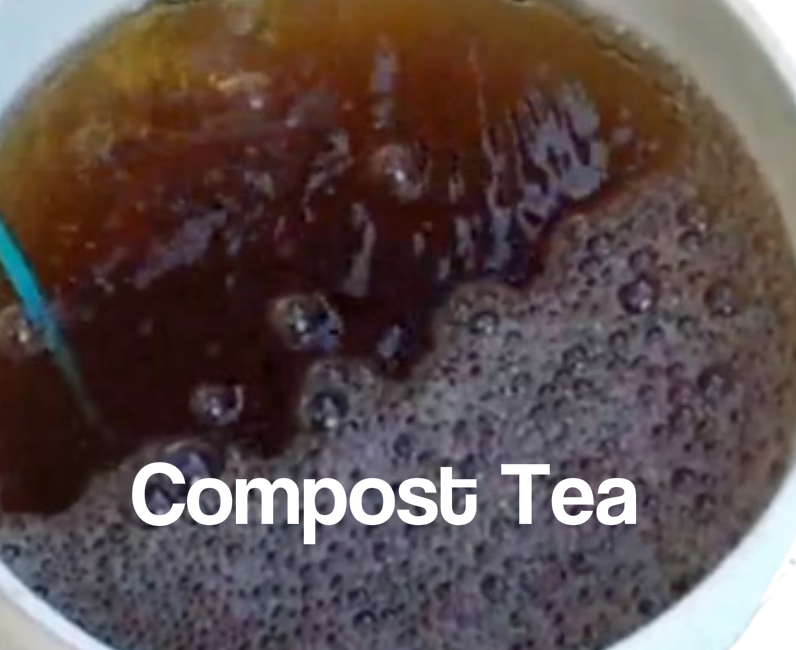 Put the teabag and its contents to one side but don’t discard, because you can use each batch of compost at least another twice. You can tank mix your compost tea with a range of Bio-Stimulants like Molasses and Seaweed and add Nitrogen or other nutrients via Bio-Liquid Fertilisers. So, you’ve applied your first batch of compost tea and it’s now working its magic on your soil, so what next? Do it again of course! Each batch of compost can easily be brewed 3 times, but it’s important not to let it sit around too long. For maximum benefit it’s best to re-brew as soon as possible, so simply refill your brewer and follow the exact same procedure as before. In 24 hours you will have another batch ready to go. Brewing and re-brewing this way you should aim to apply all of the brews/re-brews from each batch of ingredients very close together (over a period of say a week). Once you have made 3 brews with the first batch, move on to batch 2 of compost and discard the first batch. Wait a month or so and then repeat the process with the second batch of fresh compost you stored away at the beginning. Aim to get around 12 brews on the green over the main growing season if possible, although you can also apply compost tea right through the year if you wish. 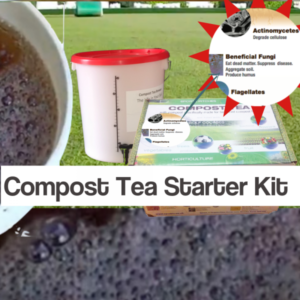 I’ve put together a Compost Tea Starter Kit for Bowling Clubs that contains everything (except the food source) you need to make a whole season’s worth of compost tea following the program above. More details on the Compost Tea Starter Kit here. There are no hard and fast rules with watering except perhaps for Thatch Eater which has quite specific watering requirements. LDP treatments of course need a careful watering plan too, but this will be specific to each green. In particular the Aquacept/Hydroaid combination should be used in conjunction with frequent hand watering of affected areas. For Bio-Stimulants and Compost Tea the application rates include suggested water volumes for spray applications and I recommend that the Soil Drench water rate is always used unless advise otherwise. Beyond that, green watering should conform with the advice in Performance Bowling Greens where I’ve laid out an irrigation monitoring/measuring system that will be relevant to most greens as it takes rainfall and previous irrigation into the calculation. Granular products will always usually need a light watering in on 2 or 3 occasions after application depending on prevailing weather. Just wondering whether it makes any difference as to what setting I put the air pump on during the brewing process? I see it can be set on high or low, so I just wanted to know whether this would have any impact. Try the pump on the high setting, but if it starts to foam up too much, go back to the low setting.